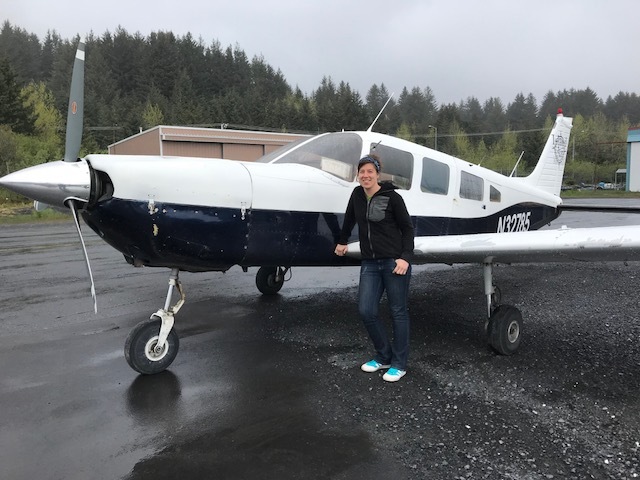 Dorothy Olmstead recently arrived in Kodiak to join our team at Island Air Service and will soon be flying the line as a Cherokee 6 pilot. Dorothy comes to Island Air Service from Glen Ellyn, a suburb of Chicago. Like many of our pilots, Dorothy’s journey before arriving in Kodiak includes a variety of different life experiences, including world travel. Dorothy attended college at Emerson College in Boston where she majored in writing, literature and publishing with a minor in marketing. With her degree in hand, she decided to travel to gain new experiences that could be used to further her writing career. She still maintains her travel blog, www.professionalnomads.org, but also notes that she has been too busy lately to keep it updated. Dorothy spent a winter snowboarding at Lake Tahoe, followed by a summer in Denali where she fell in love with Alaska. Several years passed, alternating between Girdwood and various ski resorts where she taught snowboarding. Her Alaska experience eventually led to a job as office manager/dispatcher at Fly Denali/Talkeenta Aero in Healy. This job helped ignite the spark that grew into the desire to become a pilot. She went to flight school in Grand Junction, Colorado and earned her private pilot’s certificate and later obtained additional qualifications at Lake Hood and a commercial rating in Grand Junction. While teaching snowboarding in New Zealand, a job opened up flying pipeline patrols near her home town in Illinois. This job which entailed flying pipelines from Illinois to New York to Arkansas allowed Dorothy to build the necessary flight time to qualify to fly for Island Air Service. Fast forward to today and you will find Dorothy completing the final check rides that will qualify her to fly regularly scheduled flights and charters around Kodiak. While Dorothy’s journey to Kodiak has been different than some, her desire to fly and willingness to put in the long hours and hard work to be one of the best definitely shows. Island Air Service is proud to include Dorothy in our long history of dedicated pilots who serve Kodiak’s village communities.